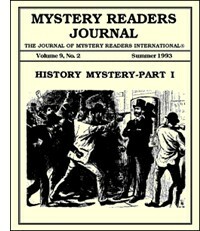 P. C. Doherty—whose doctorate in history from Oxford has led him to interweave real events and real unsolved “crimes” into mystery fiction—has joined the ranks of authors who write historical mysteries, but unlike many, he covers five centuries and, therefore, does not write a series, per se. In all of his books, the politics of the times (13th through 18th centuries), the lives and exploits of the rulers, the prominent opposition and advisors to the kings, and actual historical events are key points on which Doherty’s stories turn. Under his own name, Doherty has written nine novels (all published by St. Martin’s Press in hardcover, several also now available in paperback), four of which feature Hugh Corbett, Edward I’s faithful clerk, who is supervised in his investigations, at least in the earlier books, by Robert Burnell, King Edward’s Chancellor and Bishop of Bath and Wells. Like all of Doherty’s investigators, Corbett has few ties (“no wife, no child”) and has “reached his thirty-eighth year still enjoying robust health in an age when a man was lucky to pass his thirty-fifth.” While he profits as senior clerk in Chancery, reporting directly to the king, and in ownership of property and two bank accounts, he is not comfortable in the assignments he is given. The Corbett series, set in the 13th Century, includes Satan in St. Mary’s (1987), The Crown in Darkness (1988), Spy in Chancery (1988), Angel of Death (1990), and Prince of Darkness and deals primarily with matters of state. The first, Satan in St. Mary’s, introduces Corbett in his new job of clerk. The King wants Hugh to investigate a possible assassination plot. The story, set in 1284, involves a suicide in Hugh’s neighborhood church, St. Mary Le Bow; a Satanic cult which happens to be headquartered there; and Simon de Montfort, one of Edward’s primary enemies. The suicide, cult and assassination plot were all actual events; only Hugh’s investigation is fictional! The Crown in Darkness has Hugh sent to Scotland by Burnell, without Edward’s knowledge, to investigate the sudden death of Alexander III, King of Scotland. Alexander died on a stormy night during a wild ride to the side of his new wife, Yolanda, a French princess. Both Burnell and Bishop Wishart, Chancellor of Scotland, suspect murder, and Hugh is to find out if, indeed, murder was done, how and by whom. Hugh is sent by one cleric (Burnell) and supervised by another (Wishart) while he investigates, and eventually solves, the mystery of a regicide. Spy in Chancery is built around the true story of a traitor in the English court, who, in 1296, “was successfully managed by the French and was able to send information to them about the secret plans of the English king.” By the time this story starts, Bishop Burnell is dead, and Philip IV of France is capturing all of Edward’s spies. Clearly, there is a “spy in Chancery.” Edward suspects his councillors, including Robert Winchelsea, Archbishop of Canterbury, “an upstart, a sanctimonious clerk, a shallow man who always supported noble causes.” Edward turns to the one man Burnell would have chosen—Hugh Corbett—to root out the traitor. Angel of Death is concerned with another actual event — the sack of Berwick in 1298, following a great assembly of the realm in 1299, where Walter de Montfort, Dean of St. Paul’s Cathedral, who had been appointed by the Archbishop of Canterbury to argue vehemently against the king’s right to tax the Church, died mysteriously in full view of the assembly. Because de Montfort was poisoned during the consecration of the wine prior to the delivery of his sermon, suspicion for the murder falls both on the King, who would wish any member of de Montfort family dead, and the five priests who assisted in the Mass. The hierarchy and corruption of the Church at this time in British history is clearly outlined as Corbett investigates the murder and the possible motives behind it. The remaining five Doherty novels do not include Corbett, and occur well after Corbett’s century. In the 14th Century mystery, The Death of a King (1986), the “present” King of England, Edward III, wants to know if Edward II was murdered. And if so, how and by whom? History states that he was imprisoned at Berkely Castle, and, subsequently was cruelly and gruesomely killed by Guerney, Ockel and John Maltravers, the latter having been entrusted with the King’s custody. Doherty’s story begins some 17 years after this death. Edmund Beche, a very junior royal clerk who has no living relatives or close friends, is assigned to investigate the murder. He is to be supervised by John Stratford, Archbishop of Canterbury. The assignment seems to Beche to be a no-win situation. While he is told he has carte blanche, he begins to get the impression that he is being subtly guided to a predetermined decision. After all, who would miss him if he disappeared? Therefore, in order to safeguard his actual discoveries, he tells the tale of his travels from London to Italy in a series of 13 letters dated between August, 1345, and February, 1347, to a former classmate from Oxford, Richard Bliton, Prior of Croyland Abbey. The plot is full of twists and turns. Even in the final pages, a little mystery is left up to the reader to solve: Did Beche actually find the truth behind the death of Edward II? Doherty’s sixth and seventh mystery novels, The Whyte Harte (1988) and The Serpent Among the Lilies (1990), are set in the 15th Century, and feature narratives by Matthew Jankyn, ex-scholar, liar, mercenary soldier and thief, but, in Jankyn’s own words, above all else a liar. In The Whyte Harte, Jankyn tells the tale of the death of Richard II, the events leading up to that death, and the mystery enshrouding it. Of course, Jankyn is a liar. But perhaps “not too much of a liar.” Jankyn’s narrative relates his own past, a past spent unwillingly under the tutelage of priests and friars in an Augustinian monastery; his rebellious flirtation with the heresy of Lollardism; and finally his becoming a thief, an accused traitor, and yeoman to Bishop Henry Beaufort, Bishop of Winchester, King’s Chancellor, illegitimate grandson of “The Black Prince,” and half-brother to King Henry V. It is Beaufort who “rescues” Jankyn from Newgate prison to serve as his investigator of the rumors that Richard II is not dead, but alive in Scotland, encouraging the small rebellions under the sign of the White Hart. The Serpent Among the Lilies sets Jankyn (the serpent) among the followers of Jeanne d’Arc (the lilies) at the behest of Beaufort. Beaufort wants to know if Jeanne is really a saint, and how to get to her so that the war against the British can be foiled. Jankyn, despite his criminal background, comes to like Jeanne and to resent being pitted against her. Somehow, Jeanne acts as if she KNOWS that Jankyn is a spy. A nice twist in the story of the trial and execution of Jeanne finish this book off nicely. Doherty entered the struggle to determine if, indeed, Richard III did kill the “Little Princes” in the 1480s in The Fate of the Princes (1991). This book features Francis, Viscount Lovell, a close friend and confidant of Richard III. Lovell, who was never seen again after the Battle of East Stoke in 1487, tells the tale in his dying memoirs. As usual, real persons and events are used to make Doherty’s tale believable and, while Richard is not made out to be quite the hero Josephine Tey portrays in Daughter of Time, Lovell’s account is a creditable account of what might have happened in those fateful years of Richard’s doomed reign. The Masked Man (1992) brings us 18th Century Paris, a change in scenery as well as century. Ralph Croft, a typical Doherty rogue, who also goes by the names Scaramac or Scaramouche, is an English ex-patriot now imprisoned in France for various crimes, including forgery. After mysteriously being freed by the archivist Maurepas and the cold-blooded killer Captain D’Estivet, he is offered a pardon if he can assist them in finding out the true identity of “the Man in the Iron Mask.” Naturally, he suspects that he will not live to see the end of this intrigue, and spends as much time plotting his escape as detecting. According to my sources (thank you, Dean James! ), Doherty is also writing historical novels under three other names! As Paul Harding, he has a 14th-century London series featuring The Nightingale Gallery (March 1993 hardcover) and The House of the Red Slayer (Headline, 1992; reviewed in this issue by Dean James); as C. L. Grace, he has a 15th century Canterbury story about a woman physician called A Shrine of Murders (May 1993 hardcover and also reviewed in this issue by Dean James); and as Michael Clynes, he is writing a series about a rogue operating during the time of Henry VIII, starting with The White Rose Murders (March 1993 hardcover)! If you are a fan of the historical novel, where the setting and the characters are authentic, and where some of the characters are actual historical figures, then you might wish to try the mysteries of P. C. Doherty (aka Harding, Grace and/or Clynes). Updated from columns written for Mystery Readers Journal (1987, “The Medieval Cleric as Sleuth,” Vol. 3(1):5-8, and 1988, “The Medieval Cleric, cont’d,” Vol. 4(1):13-14); Most Loving, Mere Folly (1990? ); and Alfred Hitchcock’s Mystery Magazine (May, 1990). The millennium during which Europe made its transition from ancient to modern, the so-called Middle Ages, is generally given the dates 500 to 1500 A.D. for the sake of convenience. This thousand years was a period of enormous change, as the cultures of the ancient Roman Empire and the barbarian hordes which helped bring about the Empire’s fall commingled and created a new civilization which we call “medieval.” This adjective is facilely used to describe a civilization made up of many diverse peoples and other components, and generalizations are easy and tempting when one tries to sum up one thousand years of European history. Mystery readers impatient with the kinds of debate that can occupy the academic mind, however, are fortunate in that a number of writers are making use of the great diversity that the Middle Ages offers to create fascinating series of mysteries set in varying places and times. Ellis Peters, creator of the twelfth-century Benedictine monk-detective, Cadfael, is the best known and most popular, though another writer, P. C. Doherty, is rapidly building his own niche in the field of the historical mystery as he writes under his own name and three pseudonyms, Michael Clynes, C. L. Grace, and Paul Harding. Other writers, like Sharan Newman and Kate Sedley, are following in the paths of Peters and Doherty to a certain extent. As the most prolific of the writers of medieval mystery, however, Peters and Doherty most easily bear analysis. There are some similarities in what they do, but they are overall very distinctive in their depiction of medieval England. Perhaps the most important distinction between Peters and Doherty is the role of religion and the Christian faith in their work. Cadfael, after a lifetime of waging war, enters the Benedictine order and devotes the rest of his life in service to God. Cadfael’s faith in God and His justice is strong, just as strong as his faith in God’s love and care for all of humankind. Thus Cadfael observes all that occurs with a benign and forgiving eye for the foibles and iniquities of humankind, and it is this spirit of charity, in the truest Christian sense, which lends such a remarkable feeling of warmth and humanity to the work of Peters. Readers trust in Cadfael to have the wisdom and compassion to do everything within his power to set the disordered situation to rights. Doherty has, with one exception, used primarily secular figures as his detectives, such as Hugh Corbett, a clerk in the court of Edward I. (The main exception is Doherty’s series under the name Paul Harding, in which the main character in a Dominican friar named Athelstan.) Doherty’s men are no less worldly-wise than Cadfael, though they are certainly more cynical, without the great faith that sustains Cadfael. Brother Athelstan, the Dominican friar who serves as priest for one of London’s poorest parishes in the late fourteenth century, is a man of faith, but he has not yet the spiritual and emotional maturity of Cadfael. Whatever his doubts and troubles, however, Athelstan remains devoted to his parish and to his service in God’s work. Another distinctive difference between Peters and Doherty is the settings of the novels, both temporally and geographically. The Cadfael novels are set during the mid-twelfth century in Shrewsbury, a small town. Doherty’s works are generally set no earlier than the late thirteenth and early fourteenth centuries, with much of the action set in London, a much larger city. The medieval world which Peters portrays is generally cleaner and quieter than the pestiferous and odiferous world of Doherty. These differences exist partly because of the differences between the rural and urban communities of the Middle Ages, though neither was certainly clean by modern standards. The sheer numbers of people dumping refuse on the streets and alleys or rivers could make a big difference, most assuredly, between Shrewsbury and London. But more important than this, however, is simply the difference in styles of the writers. Peters, though she creates vivid landscapes, is less interested in certain aspects of medieval life, while Doherty zestfully describes the sounds and odors of medieval life to give his works a distinctive flavor which often seems harsher and more realistic than that of Peters, insofar as the activities of daily life are concerned. Despite these differences in approach, both Peters and Doherty have created vital and believable stories and characters. One characteristic that both share is attention to the political situation of the times. Peters very deftly weaves her stories into the civil strife between King Stephen and his unhappy cousin Maud, who is trying to wrest the throne of England from him. Doherty, too, cannily uses the political intrigues of the period to his advantage. The medieval chronicles are chock-full of enough tales to keep even an industrious writer like Doherty busy for years to come. By writing under four different names, Doherty can utilize different periods and different settings to great advantage. Most of the works under his own name, Doherty, follow the adventures of the clerk, Hugh Corbett, during the reign of Edward I (1271 – 1307). Corbett first appears in Satan in St. Mary’s (St. Martin’s Press, 1986). Doherty has tackled the murder of the Princes in the Tower (in The Fate of Princes [St. Martin’s Press, 1990]), the story of the Man in the Iron Mask (in The Masked Man [St. Martin’s Press, 1991]), and the intrigue surrounding Joan of Arc (in The Serpent Amongst the Lilies [St. Martin’s Press, 1990]) as well. As Paul Harding he is writing what is perhaps his best series about Dominican friar Athelstan; these books are set in London in the late fourteenth century. Athelstan serves as clerk to Sir John Cranston, coroner of the City of London, and thus takes part in a number of murder investigations. The first is The Nightingale Gallery (Morrow, 1991; Avon, 1993). Under the name of Michael Clynes, Doherty writes tales of the reign on Henry VIII; his narrator is the roguish Roger Shallot, who first appears in The White Rose Murders (St. Martin’s, 1993). Finally, as C. L. Grace, Doherty has created a female series character, Kathryn Swinbrooke, a physician and apothecary who plies her trade in fifteenth-century Canterbury. The first in this series is A Shrine of Murders (St. Martin’s Press, 1993). With his diverse settings and series characters, Doherty offers snapshots of medieval England and France at differing times. Peters offers her readers a view of medieval England during a particular time in its history, but she also provides a fascinating introduction to medieval culture and intellectual life as well. Many of the books in the series present various medieval ideas which are quite different from modern thinking, but Peters explains them easily. integrating them into the plots of her novels. For example, in The Sanctuary Sparrow (Morrow, 1984), the jongleur Liliwin seeks sanctuary from his pursuers in the abbey church. The Pilgrim of Hate (Morrow, 1985) involves miracles and a pilgrimage; Monks-Hood (Morrow, 1981) explores some thorny points in medieval Welsh law. Two recent novels in the series address more complex issues: The Heretic’s Apprentice (Mysterious Press, 1989) deals with heresy and its suppressions by the Church, and The Potter’s Field (Mysterious Press, 1990) uses the medieval concept of the wheel of fate. The characters of both Peters and Doherty are recognizably different; they are distinctly medieval in what they do and how they think. These are not modern men and women masquerading in medieval garb. Peters perhaps takes more care to give her readers insight into the medieval mind, but both writers are to be celebrated for their achievements in bringing the Middle Ages vividly to life in their crime fiction. Lovers of medieval mystery can read both Peters and Doherty and enjoy them for their differences and revel in the vast panorama of life in Medieval England. That may be stretching it a bit, but I can vouch, both as a reader and writer, for the allure of mixing history and detection. When I was in high school I craved the exotic and remote locales of science fiction and fantasy. As I got older, suspending my disbelief got a bit tougher, I suppose, and those genres worked for me less and less. Still, I craved that all-enveloping satisfaction of escaping to another time and place, and I started seeking it in historical fiction; the only problem is that really good historical novels are few and far between. In my late twenties I discovered Le Carré, and found a similar satisfaction in exploring his minutely detailed and morally vexing fictive landscape; but once I’d read everything from The Spy Who Came in From the Cold to The Little Drummer Girl, plus Graham Greene and Joseph Conrad, the espionage genre ran dry for me; good spy novels are as hard to find as good historical novels. It wasn’t until I reached thirty or so that I discovered and devoured Sherlock Holmes and thereafter plunged head-first into the world of the detective mystery. The allure of the puzzle, the cozy setting, the charm of the sleuth all captivated me (after Holmes, Stuart Palmer’s Hildegarde Withers stories are my absolute favorites). Still, I had a hankering for something more expansive, more escapist, the large-scale world-creation that I’d last found in historical novels like those of Mary Renault and Robert Graves. For me, the idea of historical mystery as the perfect literary form came together when I read Umberto Eco’s The Name of the Rose, one of those rare books, like The Lord of the Rings or Wuthering Heights, that resonated to my core. It was superb historical fiction, rigorously intellectual and yet evocatively sensual, transporting me to a distant time and place; and it was also a mind-bending mystery, presenting puzzles practical, poetical and metaphysical, with a wise sleuth to accompany me through the labyrinth (or in this case, the library/maze). What combination could be more satisfying? I explored the historical mysteries of Ellis Peters, and found a tiny treasure-trove in the Dr. Sam Johnson short stories of Lillian de la Torre. But what I really craved was a full-scale historical mystery set in ancient Rome, my favorite period since childhood, when Hollywood epics and Classics Illustrated comics introduced me to the larger-than-life dramas of Caesar and Cleopatra and their contemporaries. At the time, such a novel didn’t seem to exist, so I figured I’d simply have to write it myself. The direct inspiration for the first novel in my “Roma Sub Rosa” series came from a trip to Rome. Having explored the ancient Forum and wandered though the ruins of Ostia, I felt a craving for a taste of ancient Roman literature, a field I knew from studying ancient history and Classics at the University of Texas at Austin. Back home in San Francisco, I spotted a copy of Cicero’s Murder Trials in a used book store, took it home, and settled down to read his oration “In Defense of Sextus Roscius.” The rest is history—and mystery. Reading between the lines of the scandalous murder case that launched Cicero’s career, I caught a glimmer of what I thought would be a terrific detective story. I started digging, plotting, writing — historical research is delightful detective work—and two years later, Roman Blood was finished. In the fall of 1991 it was published by St. Martin’s Press. Healthy sales and a paperback sale to Ivy Books prompted my editor, Michael Denneny, to press me for a sequel. Arms of Nemesis, set against the background of the Spartacus slave revolt, followed in 1992. Novel number three in the “Roma Sub Rosa” series, Catilina’s Riddle is scheduled to come out in November 1993. Now I’m busy researching the fourth installment in the adventures of Gordianus the Finder, my Roman sleuth. When I started Roman Blood, I thought I was working on a fairly lonely patch of literary ground. It wasn’t until I had finished the manuscript that I saw Colleen McCullough’s epic First Man in Rome in a book store. Well, I figured, as I watched it leap onto the best seller lists, anything that gets readers interested in ancient Rome can only help. Then came Lindsay Davis’ Silver Pigs and John Maddox Roberts’ SPQR, both of which have turned into series. Then I discovered a couple of Roman mysteries that had been published in 1989, A Roman Death by Australian Joan O’Hagan, and Dogheaded Death by Ray Farady Nelson. And when Roman Blood came out, my own publisher had yet another Roman mystery in the very same catalogue, Roman Nights by Ron Burns! It’s curious that all these mysteries with Roman settings came out so close together. Given the time scale, it’s clear that none of the writers involved took inspiration from the others—it was just a curious coincidence that we all experienced a similar brain wave at roughly the same time. I only hope that readers will continue to pick up on that brain wave, and that the market for detective historicals continues to flourish and grow, so that I can keep taking my own time trips back to ancient Rome with Gordianus the Finder in search of murder, mayhem, and clues. Anyone out there with a taste for historical sleuthing is more than welcome to come along.